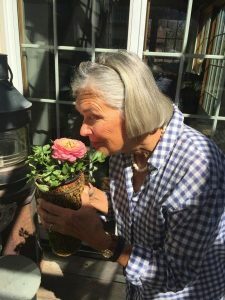 How Parkinson’s Disease Taught my Grandmother Valuable Life Lessons | Ridge's Stitches | Health Coach. Yoga. Clothing. Slow down. Take a deep breath. Go outside and appreciate the smell of the flowers. Take time to understand the beauty of the world. My grandmother, Sylvia, was diagnosed with Parkinson’s disease when she was 65 years old. She started to notice that something was not right when her balance started to go. She would get very dizzy and didn’t understand why. So she went to get some testing done. They told her she had Parkinson’s disease. She began going to all these Parkinson’s meetings and said to herself that she just could not let this happen to her. She was determined. She put it out of her mind and focused on exercising and just became extremely busy. “I never watched television. I never sat down in the evening. I just kept being busy. I like it,” she mentioned. Sylvia ran her own florist business. She would do flowers for weddings and had weddings almost every single weekend. This business took over. Even after the end of the work day she would still be creating flower arrangements up until she went to bed. About 5 years ago, she had a mini heart attack. This taught her to slow down. She started to really focus on her health and overall well being. Exercise was very important to her and pacing herself became more of a focus. “I watch what I do. I don’t take on more than I can handle,” she said to me. Rest and planning attributed to keeping her health in check. She realized when big events would come upon her, she really needed to get organized days in advance. This gave her the opportunity to take things slowly so that there wasn’t as much pressure the day of the event. She went back to her doctor and he mentioned he wasn’t sure if she even had Parkinson’s disease. They said her symptoms would have been worse at this point. My grandmother makes an effort to really absorb the magnificent world around her. Her meditation is a simple process of stepping outside and breathing in the fresh air. “I can’t ever go past a flower and not smell the wonderful fragrance in the world. When you walk past rosemary or you step on sage or lavender, oh gosh. Or looking at a spider after they’ve spun their web in the morning and there is some morning dew on the web. It’s just unbelievable,” she discusses about the beauty around her. So take the time to appreciate the little things and express gratitude for the morning dew or the scents of this world. For the month of April, we will donate a portion of our sales to the Michael J. Fox Foundation for Parkinson’s Research. Enjoy the beauty of a product with a purpose and order your stitch today.